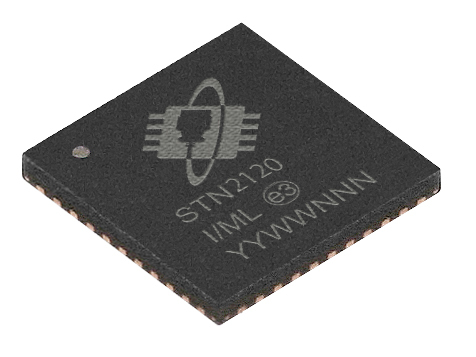 STN2120 is a 44-pin OBD to UART interpreter IC that provides bi-directional, half-duplex communication with all vehicle OBD-II legislated protocols, plus support for SW-CAN (GM) & MS-CAN (Ford). STN2120 is available at the same price as STN1170, yet has twice as much flash and four times as much RAM, allowing for more features to be included with future firmware updates. SW-CAN protocol support allows your device to access, monitor and issue commands on vehicles utilizing GM’s proprietary CAN network. Similarly, MS-CAN provides access to Ford’s proprietary CAN network on supporting models. While STN2120 ST commands will provide access to SW-CAN and MS-CAN networks, the proprietary GM & Ford codes must be obtained independently. A popular method is to join the Equipment and Tool Institute where the codes can be accessed/purchased. Alternately, the traffic can be analyzed and reverse engineered. Perfect form factor for any application. STN2120 is available in the QFN44 package. Solid, field-tested software. STN2120 runs the same proven code that powers the popular STN1110 and OBDLink family of PC-based OBD interfaces. Thanks to its large user base, any problems are discovered and corrected quickly. Large OBD message buffer. STN2120 has over five times as much RAM as its nearest competitor, virtually eliminating BUFFER OVERFLOW errors. Automatic protocol detection algorithm is continuously fine-tuned to insure that STN2120 will connect to the widest array of vehicles, even those that do not fully conform to the OBD-II standard. 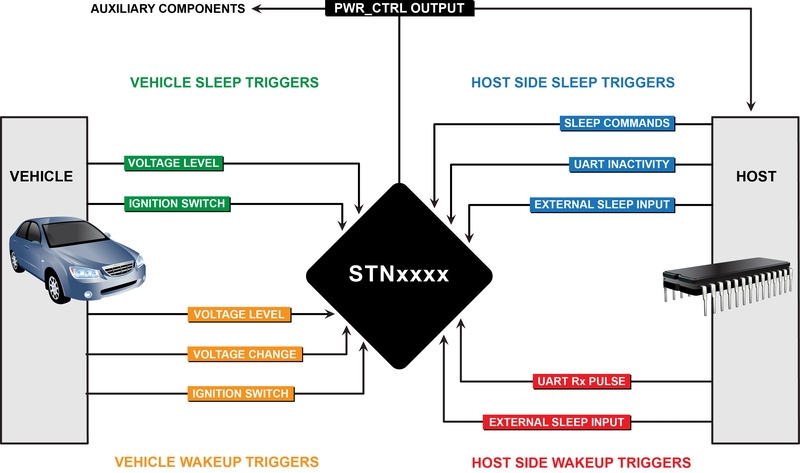 The diagram shows the various triggers available in the STNxxxx family of ICs. Please refer to the STNxxxx PowerSave Functionality documentation for more details. Please contact us for additional inquires. For small quantities, lead time is only a few days. For production level quantities, please allow 6-8 weeks lead time.